Now this recipe has been doing the rounds for a while, I keep drooling over versions of it on the vegan forums and I just knew I had to have a go of doing a version myself. Everybody needs a sunny Friday recipe, something that you can dance around the kitchen listening to radio 6 with a beer whilst you cook it. Something simple, easy, delicious and can either line the stomach for a night out or put you in a satisfied stupor for a night in front of the telly. This is my Friday recipe. 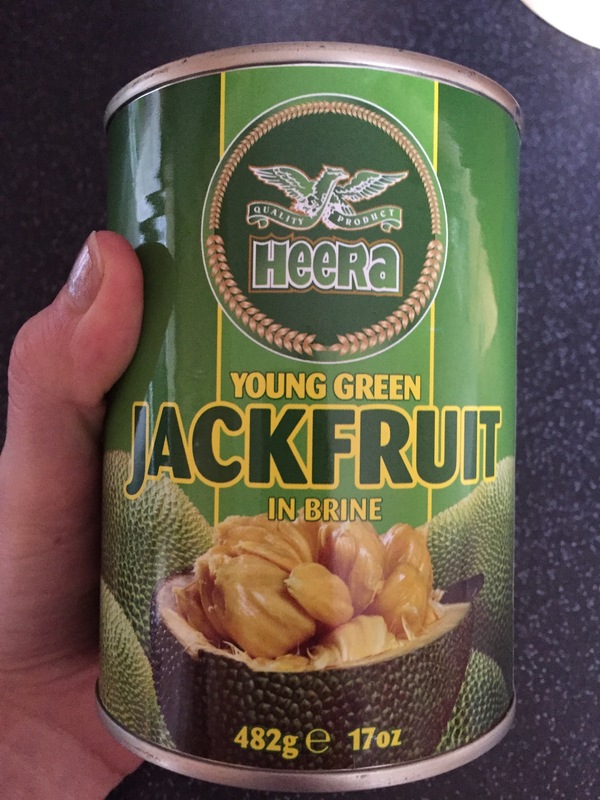 First of all, what the hell is a Jackfruit and where on this earth would I buy one?? Well if you have ever had a baby you might recognise the jackfruit as one of the fruits your babies size is compared to in the womb by pregnancy apps but a featus size comparer is not the only hat that this versatile fruit can wear. A Jackfruit is a tropical fruit that is used in Asian cooking, the young green fruit is savoury and the mature fruit is sweet like a mango. It is well known for being able to soak up flavours and having a meat like texture when cooked. These qualities really do make it ‘the jack of all fruits’. (I’ll show myself out). You can buy it fresh or canned in syrup, brine or water. For this recipe you will need it canned and in either brine or water. (You can use a fresh one but that takes the recipe from Funtime Friday to Fafftime Ain’t No One Can Be Arsed With That Day, and the syrupy one is just too sweet). You can usually buy tins in Asian Supermakets but be careful to buy the right one. I bought mine from the Alternative Stores vegan supermarket in Palmersville. 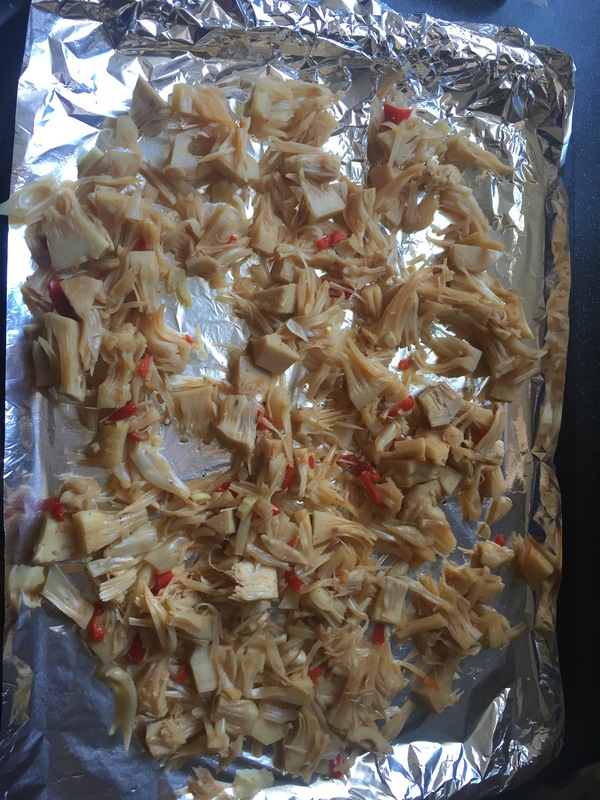 Take jackfruit out of their tins, drain and rinse them. Cut the core off each segment and if you can be bothered deseed them. 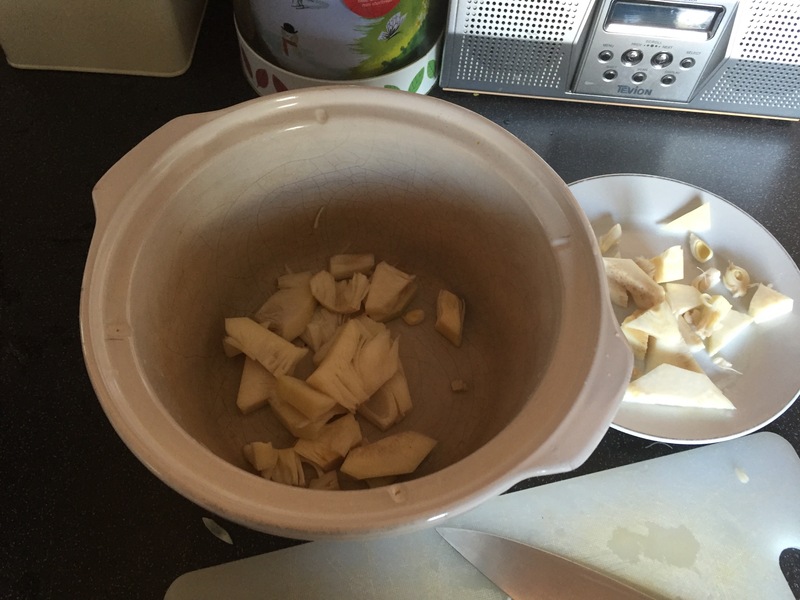 Once this is done put all the ingredients except the Reggae Reggae sauce in the slow cooker and cover with boiling water, you want enough water to cover then about 1cm. 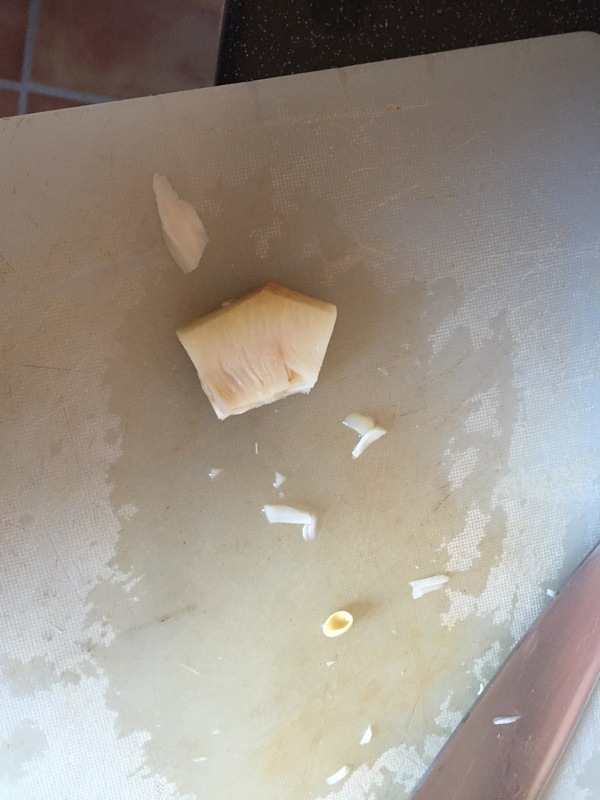 Once the jack fruit is softened take out of slow cooker with a ladle, draining away any excess liquid. Place on foil covered baking tray and spread out, pulling apart with two forks until it resembles pulled pork. Pop in the oven at 180 for 15 minutes. Take out the oven and cover in Reggae Reggae sauce to taste. Put back in the oven for a further 10 minutes. Once out the oven serve as you would pulled pork. 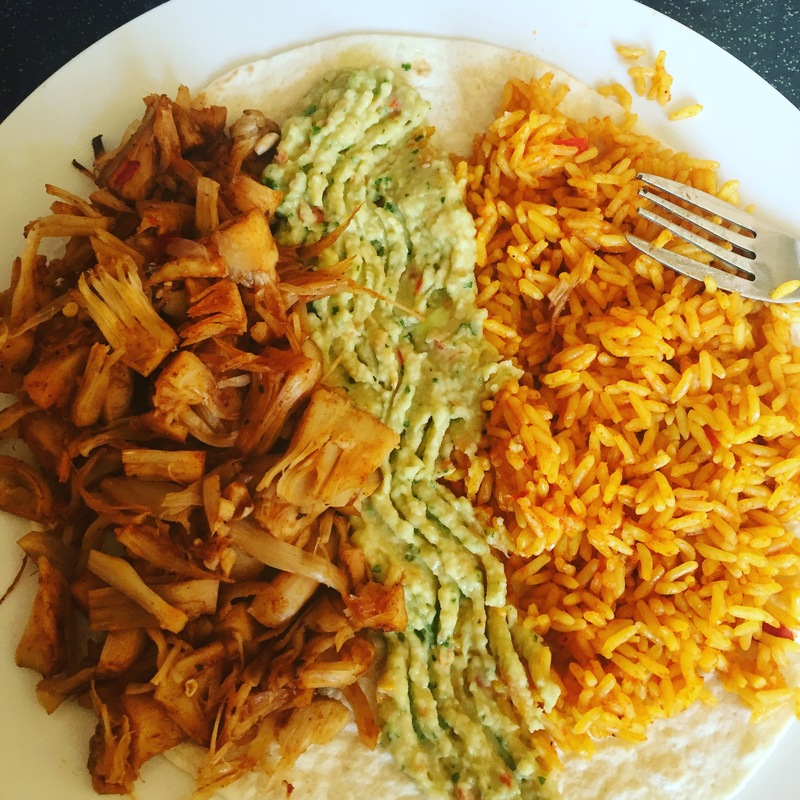 It’s lovely in a sandwich on its own, or in a tortilla with homemade guacamole and rice. This is how I had it yesterday. I also had a beer or two. Hmmm Friday’s!